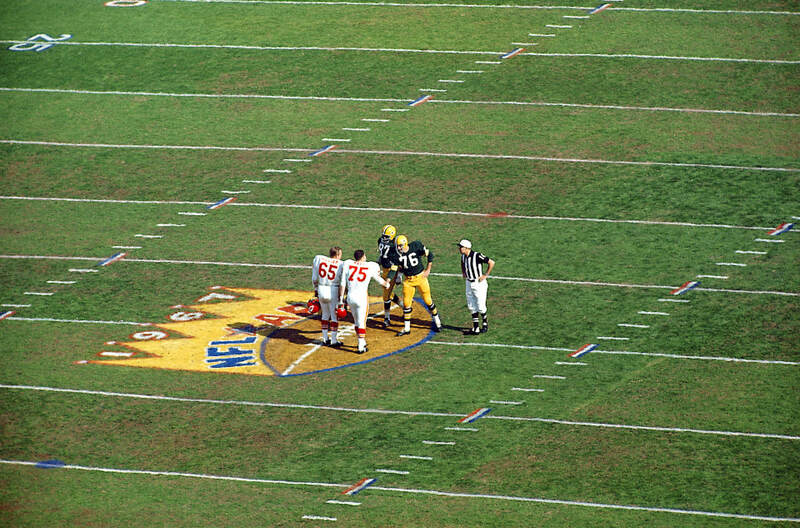 At the time it was contested, the first Super Bowl was referred to only as the AFL-NFL World Championship Game, and was played before a half-empty Memorial Coliseum in Los Angeles, California. In reality, the stadium had sold around three-quarters of the tickets, but the spaced-out design of the Coliseum gave the appearance of more empty seats than there actually were. The Green Bay Packers came into the contest firm favourites. They had posted a 12-2 regular season record in 1966 and held off a late comeback from the Dallas Cowboys in the NFL Championship game for a 34-27 victory. It was the teams second consecutive NFL championship, their fourth in six years, and the fifth appearance in the championship game in the seven seasons of the 1960s. ​To say they were already the team of the decade was an understatement. The Kansas City Chiefs on the other hand, while undoubtedly one of the best teams the AFL had to offer, and certainly the best in 1966 with an 11-2-1 regular season record and a 31-7 victory over the Buffalo Bills in the AFL Championship game, were not given much of a chance by many pundits of the game. So when the gun went for the end of the first half with the Packers holding on to a slim four point lead, 14-10, many NFL loyalists shuffled their feet nervously in the stands or the press box. The Kansas City Chiefs had actually outgained the Packers' steamroller of an offense 181 yards to 164. However, an interception of Len Dawson by Willie Wood early in the second half, a pick he returned to the Chiefs 5-yard line, set the tone for the rest of the game. Shortly after Elijah Pitts rumbled over from 5 yards out to make the score 21-10. From there, the Packers didn't look back, scoring two more touchdowns to make the final score 35-10 in their favour. 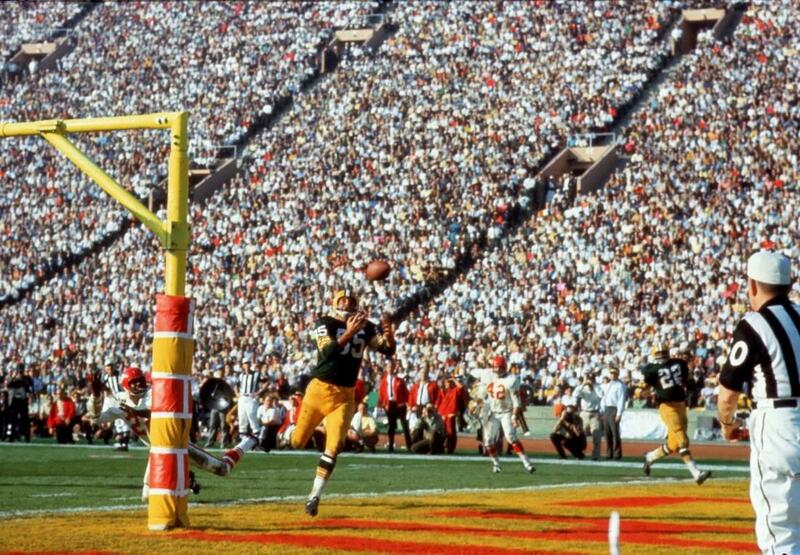 Green Bay signal caller, Bart Starr, was named the game's MVP, as he completed 16 of 23 pass attempts for 250 yards while throwing a touchdown against an interception. Green Bay Packers' quarterback would be the first MVP in Super Bowl history - completed 16 of 23 passes for 250 yards and two touchdown passes. 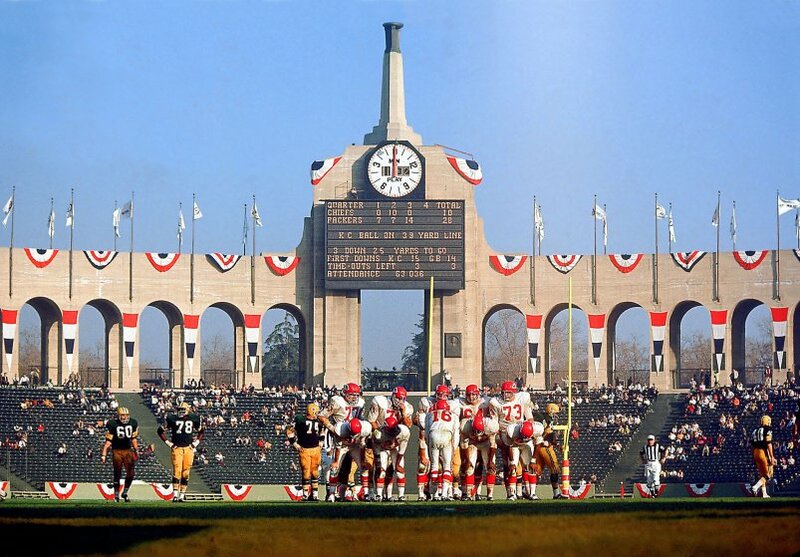 The first Super Bowl was played at the Memorial Coliseum in Los Angeles, California. Note the empty seats - something unheard of today! National Anthem: The University of Arizona and the University of Michigan marching bands. Halftime Show: Al Hirt with the University of Arizona and Grambling University marching bands. Kansas City Chiefs quarterback, Len Dawson, played an inspired game in defeat. 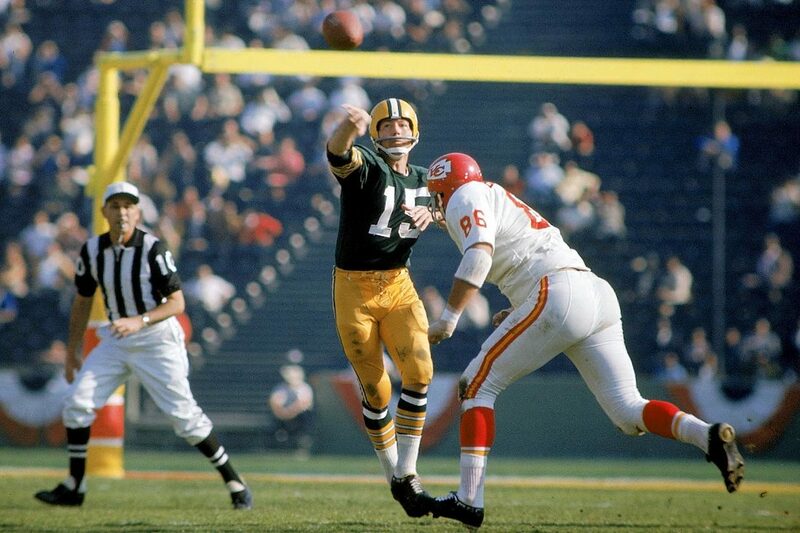 Green Bay Packers' wide receiver, Max McGee, who had been a back-up throughout the regular season catching only 4 passes for 91 yards and a single touchdown, was the unlikely hero of Super Bowl I as he snared 7 passes for 138 yards and 2 scores. McGee's feat was perhaps even more remarkable given that he fully expected not to play in the game, and had spent the previous evening visiting various late-night establishments around LA. McGee was considerably "worse for wear" as game time approached, and would be forced into action when starting receiver, Boyd Dowler, separated his shoulder on the Packers' second drive of the game. McGee even had to borrow Dowler's helmet as he trotted on to the field as he had opted to leave his in the locker-room. 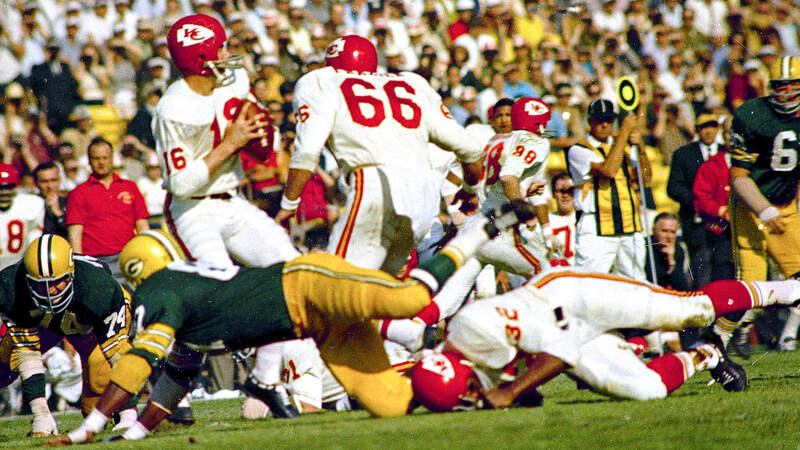 Kansas City Chiefs outspoken cornerback, Fred "The Hammer" Williamson spent the days leading up to the big game boasting of how he would knock the Packers receivers out of the contest. His prediction turned out to be more correct than most, even himself, might have imagined - only it was Williamson who would leave the game unconscious late in the second half. 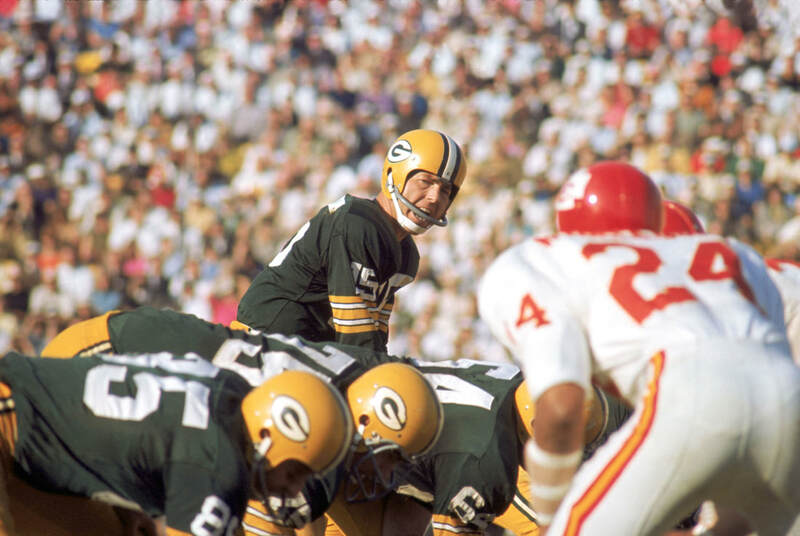 All categories recorded were essentially Super Bowl records, but notable game performances (aside from the aforementioned Max McGee and MVP, Bart Starr) include Green Bay running backs, Jim Taylor and Elijah Pitts, who rushed for 56 and 45 yards respectively. Taylor bagged a touchdown on the ground, while Pitts would notch up two rushing scores. In defeat, Kansas City quarterback, Len Dawson, racked up 211 yards off the back of 16 completions from 27 attempts, including a touchdown pass. The first Super Bowl is the only such game to be broadcast at the same time by two separate networks (CBS and NBC). This was due to exclusive contracts signed by each broadcaster with their respective leagues. Each was allowed to broadcast the game live, which led to bizarre "ratings wars" between the networks, with palpable tension even between each network's broadcast trucks and booths at the stadium. You can read a little more about this here. 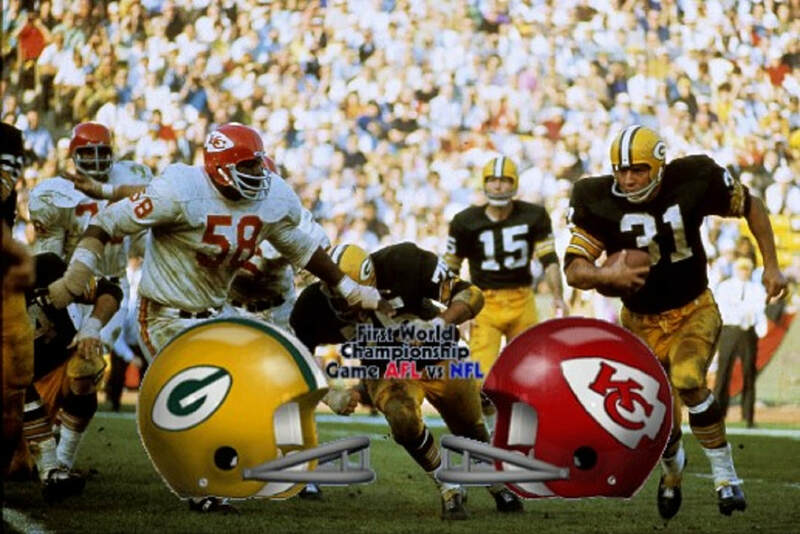 Following the game during the post-game interviews, after being asked several times if the Kansas City Chiefs were as competitive as NFL teams, Packers' head coach, Vince Lombardi, finally relented and stated, "They're (the Chiefs) are a good team, but they don't compare with a National Football League team!" He then added, perhaps masking the regret a little, "There! That's what you want me to say, I said it!" You can listen to that post-game interview in the video below. 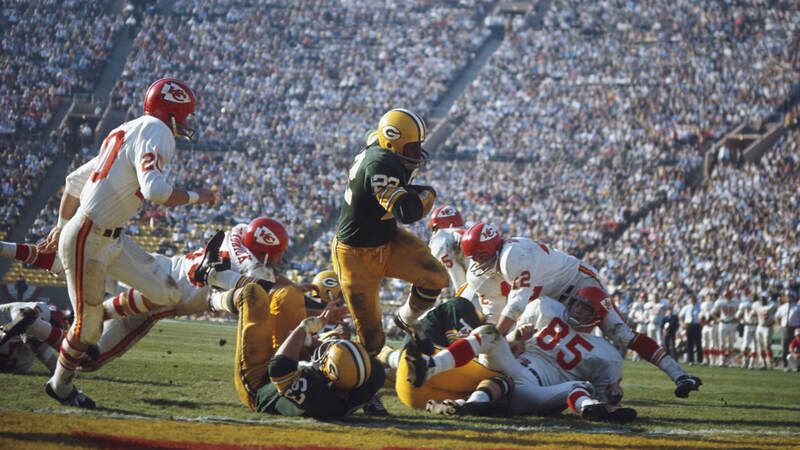 Elijah Pitts scores one of his two touchdown runs for the Packers over the Kansas City Chiefs.